Jet Bag's Daily Whine: 2010 International Home & Housewares Show! 2010 International Home & Housewares Show! In 3 days, the Wine Diaper hits Chicago! Idea Mia is heading to the 2010 Housewares show at the McCormick Center in Chicago. We're super excited to be taking part in this amazing show--thousands of buyers from stores all over the world will be on site, and we're hoping to wow them with our new product. As usual, we've got the Italians manning the booth--with the addition of another A+ salesperson: my dad, making his way down from the Great North to lend a hand at the show. 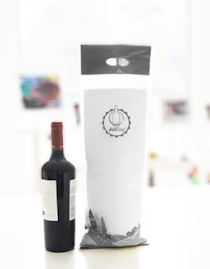 If you'll be attending the show, stop by our booth # 4065 to visit the Wine Diaper! The New & Improved Wine Diaper!